Five Live Shows including James DeGale and Joe Joyce next week! FORMER World Super-Middleweight champion James DeGale and Olympic Super-Heavyweight Silver Medalist Joe Joyce head a boxing bonanza on BoxNation next week. ‘The Channel of Champions’ has pulled no punches screening FIVE lives shows inside FIVE days as part of our stacked schedule for subscribers. DeGale and Joyce end the wonderful week of live action on Sunday September 30; when they box in Ontario, California on a card topped by an all-action fight between Victor Ortiz and John Molina Jr.
DeGale who recently relinquished his IBF 168lb World crown says his fight will be a warm-up ahead of a huge fight in December. Unbeaten fellow Londoner Joyce who is being fast-tracked to the top makes his US debut against experienced Iago Kiladze who has won 26 of his 29 fights. It’s another first for BoxNation. No channel has ever brought fans FIVE live events in such a short space of time. The extravaganza starts at noon on Wednesday September 26 when our cameras are in Xiamen, China for the first leg of the World Series of Boxing final between Astana Arlans and Cuba Domadores. Two days later, on Friday September 28 it’s the all important second leg when this year’s winner will be determined. In last season’s final The Arlans defeated the Cubans in a tie break contest. Will the Domadores get revenge or are the Kazakh team about to become WSB four-time champions? Hours later we head to Temecula, California when undefeated Lightweight prospect Devin Haney faces three-time World Title challenger Juan Carlos Burgos. Also on the Shobox bill is a rematch of this year’s most controversial fight between Thomas Mattice and Armenian Zhora Hamazaryan. American Mattice won their first encounter on points three months ago, but the decision caused outrage in the BoxNation studio and from fans all over the world. On Saturday night, September 29 we’re on the American East Coast for the next instalment of ‘Broadway Boxing’ where viewers will see eight live fights from Brooklyn, New York. Sunday is boxing day next week, and you will not want to miss one of Britain’s finest world title holders of recent times DeGale and Joyce who many consider a future world champion. 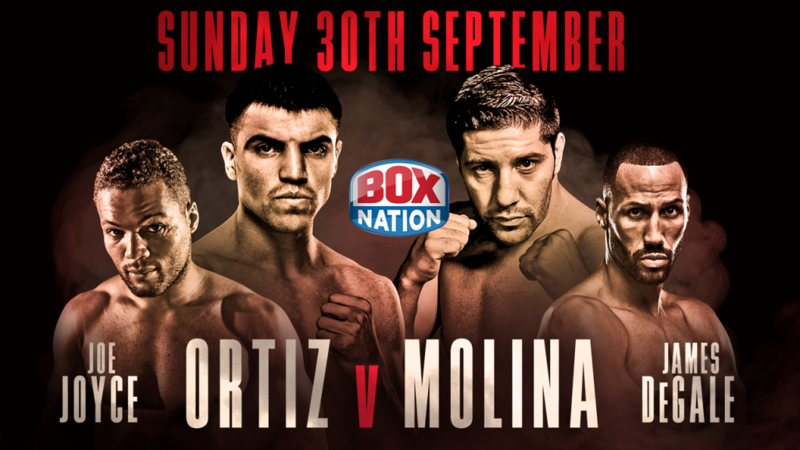 And the headline act between former WBC World Welterweight champion Ortiz and Molina Jr is a battle not to be missed. Both men only know one way to fight and that is to throw shots. To subscribe to BoxNation, and make sure you don’t miss out on all this live and exclusive action, visit www.boxnation.com and join the ‘Channel of Champions’. BoxNation, the Channel of Champions is the UK’s only 24/7 dedicated boxing channel. For just £12 per month with no minimum term customers can enjoy great value live and exclusive fights, classic fight footage, magazine shows and interviews with current and former fighters. Previous highlights have included Haye vs Chisora, Mayweather vs Canelo, Saunders vs Eubank Jr, Canelo vs Golovkin and Lomachenko vs Linares. The channel is available on Sky, Freeview, Virgin, TalkTalk, TVPlayer, online at watch.boxnation.com and via apps (iOS, Android, Amazon FireTV, Apple TV). Posted in Press Releases Tagged Astana Arlans, Bakhodir Jalolov, BoxNation, Cuba Domadores, Devin Haney, Edgar Berlanga, Iago Kiladze, James DeGale, Joe Joyce, John Molina Jr, Josue Vargas, Juan Carlos Burgos, Jude Franklin, Justin Biggs, Khalid Twaiti, Mathew Gonzalez, Melissa St Vil, Thomas Mattice, Victor Ortiz, Zhora Hamazaryan Leave a Comment on BoxNation accounces the biggest ever week of live fights!